Case study: What contributed to Renault Duster's success? No other car in recent times has created the sensation the Renault Duster has done in the Indian automotive industry. This predominantly European car has won over the Indian consumer. It has turbo-charged the compact sport-utility vehicle segment and revived the fortunes of Renault India. EXECUTIVE SUMMARY: No other car in recent times has created the sensation the Renault Duster has done in the Indian automotive industry. This predominantly European car has won over the Indian consumer. It has turbo-charged the compact sport-utility vehicle segment and revived the fortunes of Renault India. This case study looks at what contributed to the car's success. When French automotive giant Renault first entered India through a joint venture with Mahindra & Mahindra, it placed high hopes on its maiden product offering Logan - a mid-sized sedan launched in 2007. But the car with its dated looks and high pricing failed to strike a chord with Indian consumers. Such was the scale of the failure that it ended up killing the joint venture in 2010. Renault's brand name took a massive hit in India. Ironically, the Logan's failure laid the foundation for the success of Renault's compact sport-utility vehicle (SUV) Duster. After its break-up with Mahindra & Mahindra, Renault chose to go alone. It set up a Rs 4,500 crore factory at Oragadam near Chennai along with its global partner Nissan Motor Company. The facility caters to the needs of Nissan and Renault. But the Logan debacle continued to haunt the company. The first few products it rolled out from the new plant were positioned as "image drivers". It launched premium sedan Fluence in May 2011 and premium SUV Koleos that September. Both were assembled at the Oragadam plant from imported kits. Its next offering was the Pulse, a compact car launched in January 2012. The Pulse was a cross-badged version of Nissan's Micra, and was also positioned as a premium offering. Renault's focus on resurrecting its image in India and consequent premium offerings meant poor volumes in a country that prefers value for money. Renault desperately needed a "volume driver" to shore up its operations. It identified a gap in the SUV segment. "There were SUVs costing Rs 20 lakh and above manufactured by global players and those priced from Rs 6 lakh to Rs 10 lakh produced by Indian companies. We saw an opportunity there," says Armelle Guerin, Director, Product Planning at Renault India. The company launched the Duster priced between Rs 8 lakh and Rs 12 lakh in July 2012. The Duster took the Indian market by storm. It fuelled the segment of compact SUVs and grabbed a 23 per cent market share within a year. The Duster's success was such that Renault had to triple production within months of its launch from seven per hour to 20 per hour. Today, one in three cars produced at the Oragadam plant is a Duster. That is not all. 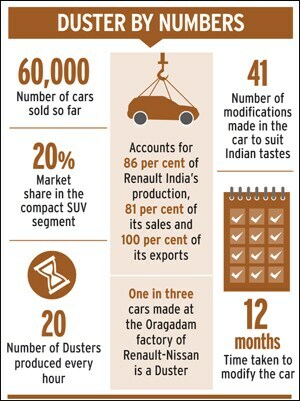 The Duster today accounts for 86 per cent of Renault India's production, 81 per cent of its sales and 100 per cent of its exports. How did a predominantly European car win the hearts and minds of difficult Indian customers? The answer lies in what Renault India did in the 24 months following its decision to bring the Duster to India. The Duster was Renault's first 'real' offering in India after the Logan. "The Logan's failure reminded us of the importance of understanding the customer, getting the product right and positioning the Duster correctly at the time of the launch," says Marc Nassif, Managing Director, Renault India. The company went back to the drawing board to understand the Indian customer. It identified a focus group of about 200 people whose profile matched the potential buyer of the Duster. It then short-listed 30 families from this focus group across five Indian cities for an ethnographic study spread over two months. During this period members of the product development team lived with their target customers to observe them, understand their lives and needs. They also spent time with the customers to know what they liked and did not like about their vehicles. The study threw up 41 modifications that the European Duster needed. Guerin says the exercise enabled the company to understand what a car should have to meet an Indian customer's needs. "We understood that a critical purchasing factor of a car in India is the exterior design," she says. "People loved an SUV with rugged looks that stood out in a crowd, but at the same time wanted it to operationally perform like a sedan - easy to drive and [offering] good fuel efficiency." There were other lessons as well. The study revealed that Indian consumers liked a strong dose of chrome on their cars, especially the exterior. They liked body-coloured bumpers. Inside the car they preferred a dual-tone interior, and wanted the switches for power windows on the door rather than in the central console. Since a good proportion of Indian cars are chauffer-driven, the rear seats needed special treatment. Indians preferred inclined seats for greater comfort. Rear air-conditioning was critical and so was the armrest, a mobile charger and a reading light. Some storage space was also welcomed. The European Duster did not have these attributes. Renault made several changes in the car to suit Indian conditions. These included reinforcing the suspension to tackle rough Indian roads and offering a higher ground clearance. It added more brackets to the car's doors as they tended to be used roughly. The engine was tuned to meet the quality of the fuel in India and deliver high efficiency of at least 20 km per litre. The tuning of the engine was done in Paris; the company shipped diesel from India to get the tuning right. In early 2011 the company conducted a customer clinic in New Delhi to validate its learning. It put the prototype of the European Duster, after the necessary changes, alongside rival cars in a price range of Rs 7 lakh to Rs 12 lakh, and asked a few potential customers and car experts for their views. All of them had to also sign a confidentiality agreement with Renault. "What we got was a 'wow'," recalls Guerin. "The feedback we got showed us that we were on the right track." The company then set to make actual changes in the car. "We identified a 3F strategy - Fast (the adaptation to Indian needs must happen within 12 months), Frugal (on limited budget) and Fantastic (with no compromise on quality)," says Karim Mikkiche, Managing Director, Renault Nissan Technology & Business Centre India, whose team executed the changes to the car. Three teams - the product development team, Renault's design studio in Mumbai and a team of engineers - began to work as a small company within Renault India. Nassif, the India MD, was empowered to speed up decision making. "We realised early that to achieve the 3F objectives we needed the modifications to be done locally with a local team. That helped. We executed the changes in 12 months, within budget and ended up with a product people love," says Nassif. "Such a success would not have been possible if the modifications were done in Paris." No doubt, there were challenges. Paris refused to accept the set time frame of 12 months and termed the budget proposed too low. Some modifications were discouraged as it involved a lot of engineering (rear air-conditioning) or structural changes to the car (inclined rear seats). "We had to convince them that these were needed to offer the best product to the consumers here," says Nassif. When the car finally hit the market, Nassif was proved right. Today, more than 60,000 Dusters are running on Indian roads. "The Duster succeeded because it is the right product at the right time in the right segment at the right price," says Sumit Sawhney, Executive Director for Sales and Marketing at Renault India. Abdul Majeed, Partner and Leader for automotive practice at consulting firm PricewaterhouseCoopers India, says global car majors are realising that customer voice in product development is critical. "Renault has tasted success because it took the pains to understand the Indian customer," he says. Of late, Sawhney's job has become a trifle difficult. SUV sales - like auto sales in general - have slumped in recent months. Enhanced competition from rivals such as Ford's compact SUV EcoSport is chipping away the Duster's market share (it dropped to 20 per cent in July). Nassif, for his part, has a different challenge now. The Duster has resurrected Renault's brand image in the country, and Nassif realises the company needs to capitalise on the car's success. "The Renault brand cannot sustain in India only on the Duster. We will need more products," he says. Renault India needs many more Duster-like successes. 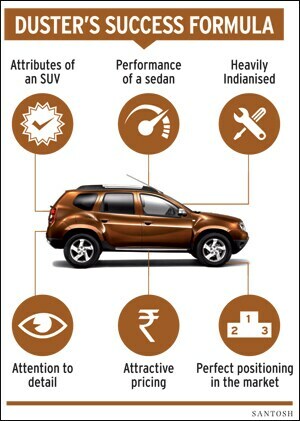 The Duster's success is more of a marketing achievement than the result of engineering excellence. Renault's strategy indicates a coming of age for the car industry in India with focus on customer-centric product development and use of consumer insights to drive engineering. Renault identified a gap in the market and used the customer voice to develop an appealing product. Though the market has matured considerably in the last decade, cars remain an aspirational product bought more for their image than only for their functionality. This is more so with an SUV. If customers were rational and made an objective comparison of costs and benefits, an SUV might not be a good choice except when the terrain demands it. SUVs are big, unwieldy, difficult to manoeuvre in cities, high on maintenance, and less fuel efficient. It is psychology and not economics that drives SUV buying. SUVs do provide functional benefits such as more space, off-roading capabilities, more power, and flexibility of use. But many customers never go off road. Renault has understood this consumer psychology. The Duster is designed with flared wheel arches, muscular body, roof rails, raised suspension and big tyres - all visual indicators to create the right image. Also, being small, it removes many limitations of a typical large SUV. The end result is a product that delivers a strong value-for-money proposition of price, convenient handling and mileage. The Duster has opened up a new category which will attract considerable competition. The newness will wear off and the success that has put a large number of Dusters on the road will dilute the novelty of its looks. Keeping the product fresh by perhaps a mid-life facelift should be a priority. Also, heavy use on Indian roads tends to take its toll on cars. Problems like rattles, niggles, mechanical and electrical failures cannot be wished away, and so a robust service support is necessary. Renault has to invest considerably in the service channel to support a volume selling product. This will finally decide whether the customers who flocked in will remain loyal to Renault. 1) Category growth: Growing demand for SUVs thanks to a number of launches by both Indian and foreign car makers, as is the case in most markets. 2) Competitive pricing: Almost all SUVs had been priced above Rs 15 lakh, with most foreign models priced above Rs 25 lakh, creating a sweet spot at Rs 10 lakh and below, where the Duster is perfectly priced. 3) Safety: Given the bad traffic in most cities and horrendous accidents we see every day, the safety features of SUVs score higher versus sedans, as the perception is that they are safer, especially for families with children. 4) Increased road travel: The poor quality of roads and highways, and increased road travel by families for holidays and leisure makes SUVs very desirable. 5) Image: The macho image of SUVs and the perception they can be used on rugged terrains, although most people may never do any off-roading, makes them a hit. 6) Fuel economy and high price of petrol: This created a strong demand for fuel-efficient diesel cars. All these factors, along with focused advertising and best-in-class after-sales service, have made Duster the top-selling SUV for the past few months, showing that even in a depressed market, if the brands get the 5Ps (product, price, promotion, place and people) correct, consumers will reward them through increased off-take. The competition in the category will only intensify, with Ford being the first to come with EcoSport, another SUV offering very good value, and other brands are sure to follow. For Renault to continue with the success, it must focus on the elements that made Duster a hit - best-in-class after-sales service, competitive pricing (not necessarily the cheapest), understanding the needs of its consumers by continuing to connect with them, and offering very competitively priced service and spares - an area where most brands seem to fail.